This article is about the year 1726. 1726 (MDCCXXVI) was a common year starting on Tuesday of the Gregorian calendar and a common year starting on Saturday of the Julian calendar, the 1726th year of the Common Era (CE) and Anno Domini (AD) designations, the 726th year of the 2nd millennium, the 26th year of the 18th century, and the 7th year of the 1720s decade. As of the start of 1726, the Gregorian calendar was 11 days ahead of the Julian calendar, which remained in localized use until 1923. Wikimedia Commons has media related to 1726. 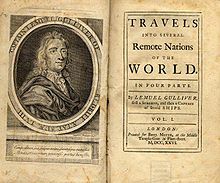 October 26: Gullivers Travels by Jonathan Swift is published. February 1 (January 21 Old Style) – The Conventicle Act is adopted in Sweden. February 8 – The Supreme Privy Council is established in Russia. April 15 – Isaac Newton tells William Stukeley the story of how he developed his theory of gravity. May 1 – Voltaire begins his exile in England. July 11 – André-Hercule Cardinal de Fleury, recalled from exile by King Louis XV of France, banishes Louis Henri, Duke of Bourbon, and Madame de Prie from court. August 7 – Pirate Nicholas Brown is captured near Xtabi, Jamaica. October 26 – Jonathan Swift's satirical novel Gulliver's Travels is first published (anonymously) in London; it sells out within a week. November – Mary Toft allegedly gives birth to 16 rabbits in England; the story is later revealed to be a hoax. December 24 – The settlement of Montevideo is founded by the Spaniards in the Viceroyalty of Peru. The Supreme Privy Council is established in Imperial Russia. The Gujin Tushu Jicheng, an immense Chinese encyclopedia, is printed using copper-based movable type printing. Muhammad bin Saud becomes head of the House of Saud. The remaining ruins of Liverpool Castle in England are finally demolished. In late 1726, Nader recaptured Mashhad.